Voluptuous and radiant hair is achievable with Certified Organic extracts of Lemongrass, Grapeseed and Gingko. Lemongrass Lift Spray is designed to add volume to the roots to make hair appear full and bouncy, while the Certified Organic Wheat Proteins give hair protection against heat styling. Ideal for root volume and styling protection for all hair types. Especially good for fine hair. Spray onto the roots of the hair or where required before drying or styling. This was the only fairly effective product of this range for me. I used this lemongrass range form MOP many years ago and sadly I have not returned to it since. 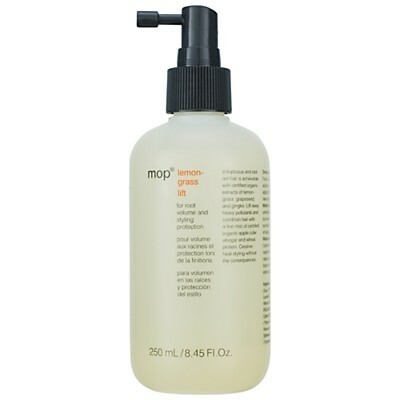 MOP hair care products are made from 100% organic ingredients and are sulfate free. Usually these products suit my hair which is sensitive to sulfates. This fine mist spray is designed to add volume and lift to limp and fine hair. The formula contains lemongrass, grapeseed, gingko and organic wheat proteins to naturally volumise and fortify the hair. The fragrance is gorgeous and is a subtle and refreshing lemongrass scent. On damp hair you simply spray the roots and then style as required. The mist does give good volume and lift without stickiness but you should definitely not over apply it! The formula is quite strong and if you over apply it does make the hair crispy. I also found that if you get this product near the ends of your hair it turns them very dry so this is another handy tip. "This was the only fairly effective product of this range for me. I used this lemongrass range form MOP many years ago and sadly I..."